Charles Taylor has been widely recognized for his contributions to philosophy, sociology, history, political science, and linguistics. But to Canadians he has given something more: A way to communicate and live together while negotiating our ethical relationships as citizens of a federation. This is important in Canada, because we are not only Anglophone or Francophone Canadians but also more deeply and differently diverse citizens of nations such as Québécois or Cree or Dene—each with a different language, historical experience, and laws. This diversity, much deeper than multiculturalism, has threatened to split the country many times over the past half-century. So helping us learn to negotiate these relationships was the greatest possible gift, which Taylor gave us not via legislation, but by helping us find a language to describe to one another how we experience life, bringing together our similar and diverse modes of being and interacting as individuals. Taylor’s particular and pervasive influence in Canada is partly the result of his long interest in politics—he ran for parliament several times in the 1960s—but more importantly his academic study of dialogue in all of its permutations. I know this firsthand. For 19 years my office was next to Taylor’s at McGill University, where we both taught, and he was a good friend and a profound influence on me. I have spent many years in dialogues with Canada’s Indigenous people and I have learned an enormous amount about dialogue from them, but I have also learned from Taylor, in both his writings and his practice. “Dialogue” means “through” (dia) participation in and of “logos” (speech). One of the central themes in Charles Taylor’s philosophical writing and teaching is his view that humans are basically dialogical animals. In essence, what makes us human beings is that we are always talking with each other, always caught in complex webs of interlocution, and at our best we experience a kind of “together-joy,” when we are communicating with each other—Nietzsche called it Mitfreude. It is the theme that has been most important to me. If you have seen Taylor teach or speak publicly you can understand why dialogue is so central to his view of the human condition: He manifestly comes alive in dialogues, enjoys them, and is “at his best” in them. But it runs deeper than this, because Taylor has taken an expansive view of dialogue, explaining four kinds of dialogical relationships that humans have with themselves, each other, and the world around us. The first is his study of the dialogical relationship one has with oneself. The history of how we talk to and make sense of ourselves as individuals is the topic of his book Sources of the Self, written in 1992. Taylor traces the ideas of the self through history: From Greek ethics based in virtue and character to the Christian turn inward beginning with Augustine, and then the tremendous deepening of self-dialogue through the Romantics, and finally to the explosion of meditation, prayer, yoga, contemplation, and so on in spiritual and secular traditions today. Secondly, he’s studied and clarified the many kinds of dialogue we have with one another: Discussion, negotiation, bargaining, deliberation, communion, teacher-student, and so on. His philosophical and political writings have been concerned with clarifying the conditions of mutual recognition, deep diversity, fusion of horizons, mutual learning, and coming to agree and act together. And these writings have been developed in the course of his long engagement in bilingual and multilingual political activities in Quebec and Canada. Some of Taylor’s work takes dialogue out of the realm of merely talking to another level. As Taylor has shown in his expressive philosophy of language, although dialogue is manifest in speech, it is grounded in practices, in the living world, and, in many cases, in the living spirit; and it does not always require speech, as, for example, in dance. “Communion” with all living beings is the most basic form of dialogue. And so his third area of interest is the relationship that humans are capable of having with the living earth (anima mundi). Here dialogue involves all the senses (synaesthesia) as we try to understand how the earth sustains life and how we can interact with it in reciprocally sustaining ways. He traces this dialogue from Goethe and Humboldt to deep ecology, the Gaia hypothesis today and Indigenous peoples’ relation to Mother Earth. Finally, there is the dialogical relationship with the spiritual realm, whether this is the human spirit of humanist traditions or the spiritual sources of religious traditions. In A Secular Age (2007) and more recent work he explores how different types of secular societies block or diminish the use of religious language in the public sphere or discredit the possibility of the transcendent dimension of spiritual dialogue. I think there is one particular kind of speech dialogue that has a certain importance for Taylor. This is when people come together not to argue, discuss, deliberate, or negotiate, but to try to suspend their emotional attachment to the deep-seated assumptions or prejudgments that pit them against one another; to put their conflicting assumptions into the intersubjective space of dialogue; and to just share and discuss these prejudgments until they begin to understand and trust one another. This non-attachment is exceptionally difficult in modern societies, and Taylor has seen many failures. But the idea, and it is a very old one, is that creative, shared meanings might just become the ongoing basis of cooperation, of living together nonviolently. This is the kind of practice of dialogical “transvaluation” (Umwertung) that he said “we can and should struggle for.” This is the great gift he continues to offer us through his remarkable speaking and writing. Where this has been particularly important for Canadians is that Taylor has modeled for us how to conduct ongoing dialogues that allow both parties to change, and change their sense of self, sometimes over generations as we join in looking at a future together. This perspective has given Canadians a whole new way of thinking about our own association as itself a complex federation that we co-articulate ourselves through dialogues, disputes, negotiations, resolutions, and new negotiations over time. Thus, being Canadian became an awareness of interdependence, or being-with others. Taylor emphasizes that this sense of the interdependence of humanity is not ethically or morally neutral. It’s actually the same mutual care that all the great spiritual traditions teach. If one wishes to bring about mutual recognition and respect in deeply diverse societies, Taylor shows, then one has to embody mutual recognition and respect in one’s own everyday interactions, in one’s relationships with others, no matter how they initially respond. The change in the larger society one is arguing for has to be the means here and now: One must be the exemplary change if one wishes to move others. For several generations of scholars, Taylor’s description of dialogic relationships and his manner of engagement have been deeply influential. These scholars have built from his ideas and taken them in new directions out of the elite political sphere to the grassroots, where they are conducting ongoing dialogues with communities to create a more participatory democracy. James Tully is Distinguished Professor Emeritus of Political Science, Law, Indigenous Governance, and Philosophy at the University of Victoria, Canada. 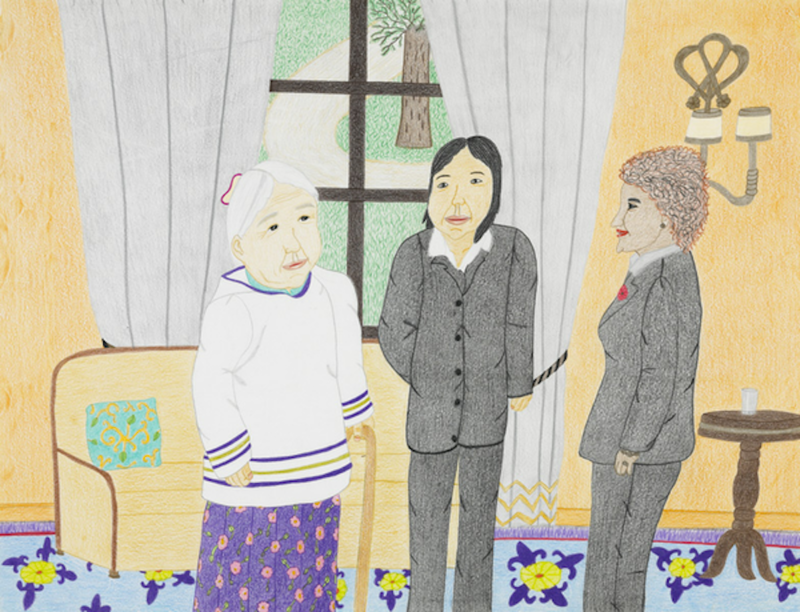 *Image by Annie Pootoogook, Untitled (Kenojuak and Annie with Governor General Michaëlle Jean), 2010. Courtesy of National Gallery of Canada/Dorset Fine Arts.